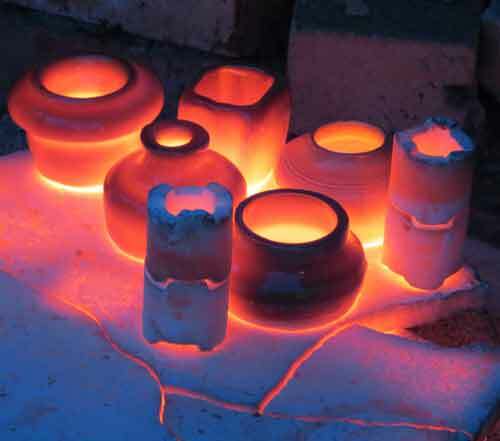 Although Raku firing is not exactly ancient, but it features bronze coloured lustres and it is based on medieval Japanese technology! 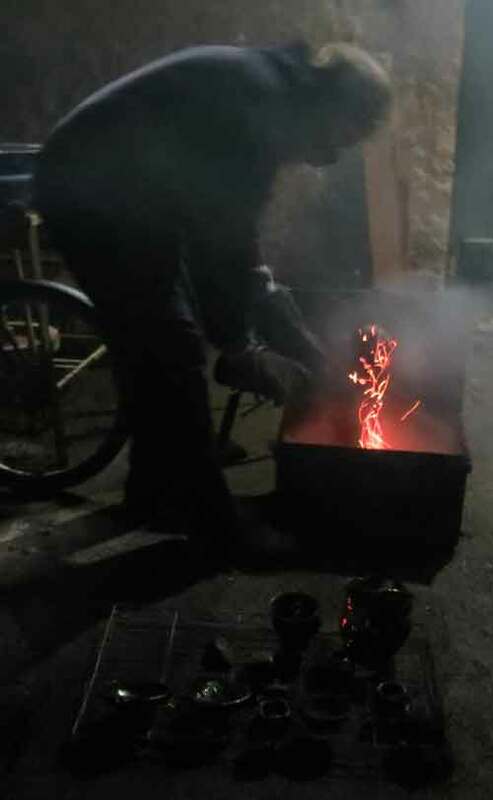 Bill Crumbleholme conducts Raku firings as part of his workshop and evening class activities. 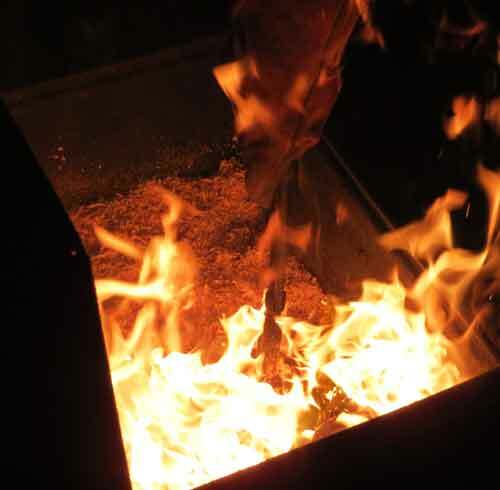 This page shows some images of firings done in December 2012. 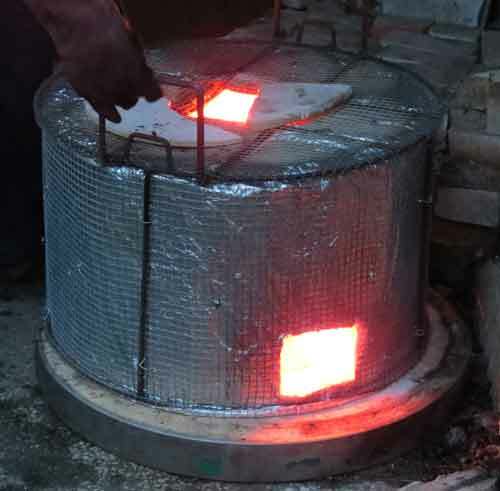 This is the raku kiln, having been heated up to 1000C by gas torch, the whole kiln is lifted off so the hot pots can be taken out. 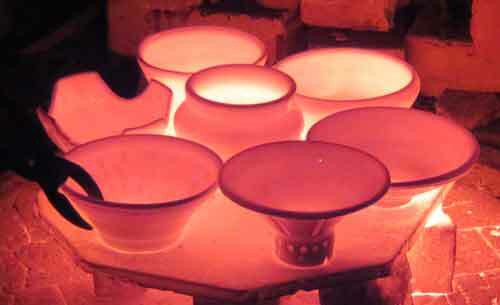 These are the pots, still very hot, after the kiln has been removed. 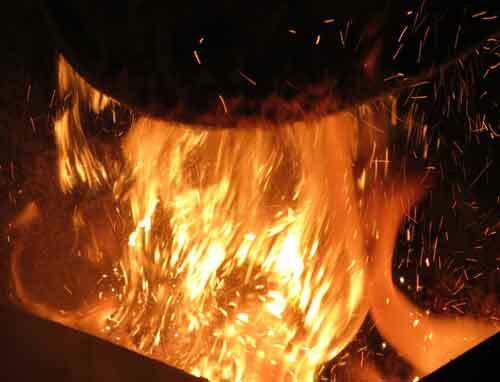 The pots are removed from the kiln using long tongs and placed in metal boxes which are lined with sawdust shavings, they are set alight and the oxygen is burnt away and removed from the pots themselves - so the glazes are "reduced" and revert to states where the metal oxides are converted to something closer to pure metal, so bronze lustres will appear. 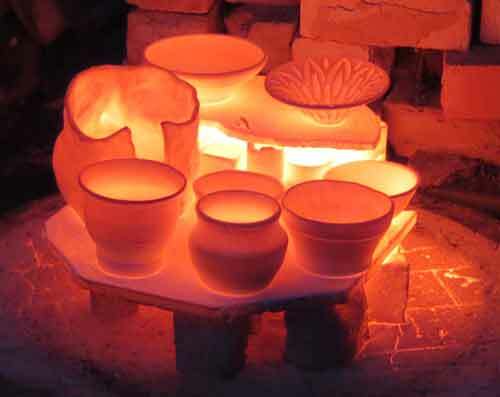 Some glazes are less "blingy" and get their beauty from the crackle in the glazes, which is stained by the smoke. The pots are smoothered in sawdust. 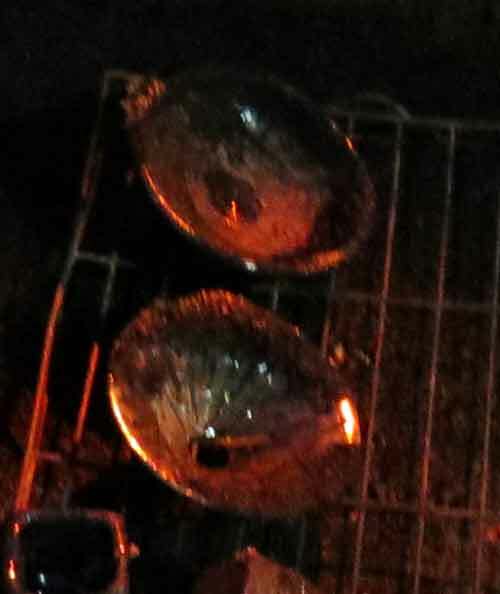 Another firing. 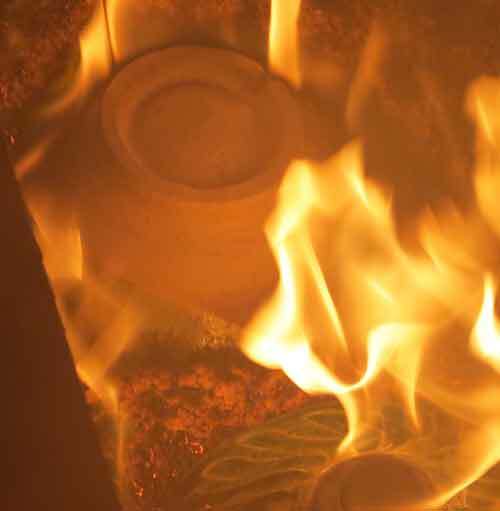 Each firing takes about an hour to heat up and several are usually done one after the other, using the residual heat in the kiln. The flames can be quite violent as the sawdust burns. 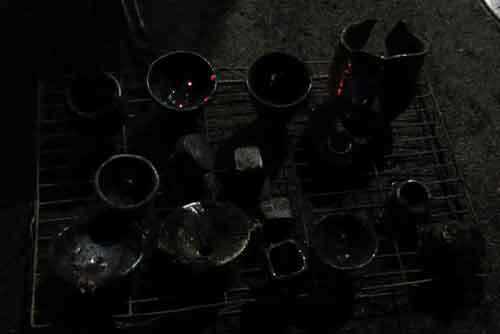 After a while cooling the pots are taken out of the boxes and put on a rack to cool further. 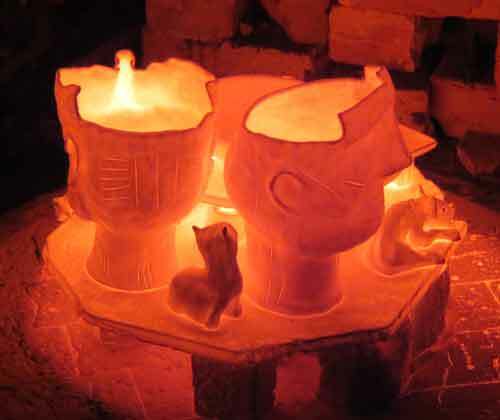 These are cooling rapidly once the kiln has been removed. The tongs can be seen grabbing the hot pot. 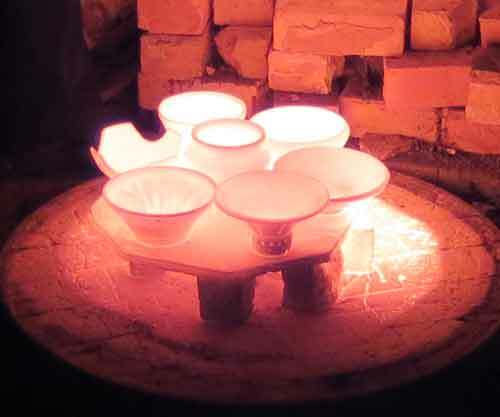 The glaze is still molten and only a small scar is left on the pot from the tongs. Another firing with some sculptural heads, made by Merle Turner, one of the evening class students and some animals made by another sculptor.